On arrival in Nairobi, Kenya's vibrant capital, you will be warmly welcomed! You will be met at Nairobi’s Jomo Kenyatta International Airport by a local Lion World Travel representative and transferred to the deluxe Stanley Hotel. The 5-star Sarova Stanley Hotel is a member of the Preferred Hotel Group and offers luxurious amenities in the heart of Nairobi. Apart from sophisticated facilities it provides exceptional standards of service. You will be able to enjoy all the luxurious facilities that hotel has to offer, as well as enjoying the bright lights that glitter across the city’s skyline. After breakfast drive from Nairobi to Aberdare National Park, where the iconic and quirky Ark Hotel is set, with a stop enroute for lunch at the Aberdares Country Club. The Ark overlooks a floodlit waterhole and salt lick, which attracts a host of awesome wildlife. Modelled after Noah's Ark, The Ark has four viewing decks with balconies and lounges to provide superb game viewing from the comfort of the lodge. The animals come to you! So as not to miss any animal sightings, the resident guide will buzz your room when special animals come to the waterhole. Simply throw on your provided robe and slippers, grab your camera and view nightlife at the waterhole! Elephants dominantly rule the waterholes and salt licks. There are other animals that come to drink water such as hyenas, which have to contend with elephants chasing them off at great speed. Some animals such as leopards are shy. However, the leopards are often seen in the morning and evening during safari drives. After breakfast you will be taken back to The Aberdare Country Club to reconnect with your driver guide. Drive north to the rugged Shaba National Reserve, where Joy and George Adamson raised Elsa the lion cub. Arrive in time for lunch at the luxurious Sarova Shaba Lodge, with chalet style rooms overlooking the Uaso Nyiro River. Natural spring water has been harnessed to ribbon its way around the property creating a beautiful landscape. Coupled with the large free-form swimming pool that flows around the lush gardens and tall trees, this refreshing water lends an almost magical feel to this natural oasis. Sarova Shaba Lodge is in Samburu/Shaba National Reserve, Eastern Kenya. Sarova Shaba Lodge décor is thatched roof, stone and timber, tastefully combining local materials and architectural style. Each room has en-suite facilities, mosquito netting and fans. The open-air restaurant overlooks the pool, river and lodge grounds. Spend the afternoon discovering the unique species found in this area including the reticulated giraffe, rare Beisa Oryx, gerenuk and Grevy’s zebra. On morning and afternoon game drives photographic opportunities abound as you seek out elephant, lion, leopard, cheetah, plains game and more. The river forest attracts a wide variety of birds too. At Tulia mini spa you can relax and unwind as you enjoy a great massage while listening to the trickling natural streams and the wild sounds of the African jungle. Or get adventurous and have the massage in the wild. 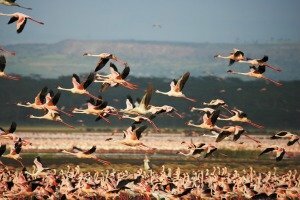 Drive south to Lake Nakuru coloured a shimmering pink from the over one million flamingos making this their home. Arrive in time for lunch at the Sarova Lion Hill Lodge, set in beautiful grounds with panoramic views of the lake and park. The lodge is a natural haven for bird life and attracts over 50 species of birds amongst the 400 species that inhabit the Park. Later venture out on safari. In addition to the flamingoes there are hundreds of species of other birds. In this rhino sanctuary sightings of both black and white rhino are almost guaranteed and you have a good chance of spotting a leopard. After breakfast enjoy a scenic drive to Sarova Mara Game Camp, a perfect base from which to explore the wonders of the Maasai Mara. 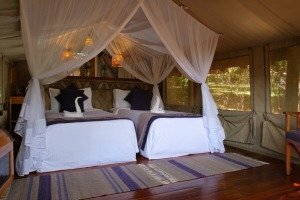 Tents are large and comfortable, tastefully furnished with double and twin beds, wardrobes, writing desk and safari chairs. En-suite bathrooms and fully stocked mini-bars blend tasteful comfort with the beautiful nature that makes the Mara. After lunch get the cameras ready and enjoy a thrilling afternoon game-viewing drive in this photographer’s paradise. The Mara is noted for its superb black-maned male lions. You may see lots of elephants and if you're lucky leopard, cheetah and rhino as well as hippo, buffalo, zebra, giraffe and many others. Morning and afternoon safaris in Africa's richest wildlife viewing arena will take you in search of spectacular wildlife. In between game drives, relax at the camp or indulge in a spa treatment. You may opt to visit the local Maasai Village or rise early for an exhilarating hot-air balloon ride gliding silently over the Maasai plains. We suggest you enhance this once in a lifetime trip with a moving and poignant visit with endangered Mountain Gorillas. A 4-night extension to Rwanda to participate in gorilla trekking is highly recommended. See our Gorillas of Rwanda itinerary for more details. Zanzibar is the perfect post-safari beach destination, with its white sandy beaches, azure waters and alluring culture. Check out our Azure Zanzibar itinerary or speak to one of our Africa Specialists for more information. We have partnered with Me to We to offer guests the opportunity to contribute directly to sustainable development in Kenya. A Me to We trip is about being immersed in a new culture, fostering genuine connections and seeing the world through a new lens. Visit a community partnered with Free The Children, a TreadRight supported charity, and connect with local families as you contribute to a sustainable development project. From building a classroom to a clean water system, be part of the change. Immerse yourself in the region’s unique and vibrant culture, led by your local guide, and leave more than a footprint behind: leave a positive impact! Learn more about the Me to We Kenya Community Experience. A visit to a local Maasai village is always an interesting cultural experience as you meet this pastoral tribe and learn about their day-to-day lives. Enhance your safari with a peaceful and scenic view over the Maasai Mara in a hot air balloon. Speak to your Africa Specialist for more information. Tips and gratuities to hotel, lodges, campe staff and driver-guide(s). Discover Zimbabwe's natural beauty and awesome wildlife in remote and unspoiled wilderness areas.